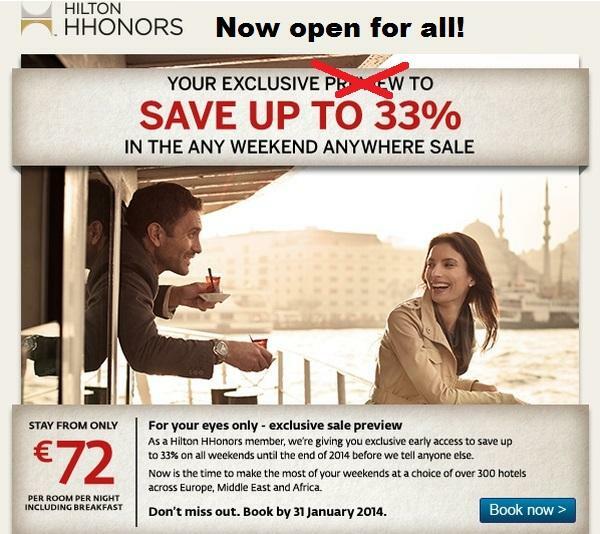 Hilton’s Any Weekend Anywhere sale for 2014 is open for reservations from December 16, 2013, to January 31, 2014, for stays until December 28, 2014. The sale offers discounts of up to 33% off the easy cancellation rates (usually called Best Flexible) for weekend stays (Friday, Saturday & Sunday). The weekend is defined as Thursday, Friday and Saturday in the Middle East. Note that these rates are prepaid, noncancelable and nonrefundable. Only book them if your plans are firm. Remember to check the prices using the other discount offers as well that may sometimes offer better rates. I don’t like the Hilton landing page for this offer at all that seems to have been made entirely tablets in mind. If you make your Hilton reservation using the link above, you are supporting LoyaltyLobby at the same time. Offer is subject to availability at participating hotels within the Hilton Worldwide portfolio of brands in the UK, Europe, Middle East and Africa. Offer available for stays booked between December 9, 2013 and January 31,2014. Offer valid for stays completed on weekends between December 13, 2013 and December 28 2014, except as indicated below. For purposes of this offer, “weekend” is defined as Friday, Saturday and Sunday nights in Europe. In the Middle East & Africa the weekend is defined as Thursday, Friday and Saturday nights. Rates are non-refundable and full prepayment required at time of booking. The booking must be made within the booked period specified herein. Your credit card will be charged immediately for the total amount quoted for the entire stay as reserved and refunds or credits will not be issued unless otherwise indicated by local law. 10% refund applies to hotels in Germany only. Charges cannot be applied to other stays, services or merchandise. Booking cannot be changed. If you fail to arrive at the hotel on the scheduled arrival date, your reservation will be cancelled and you will not receive any refund or credit. Exclusive booking period for Hilton HHonors members only applies between 9th to 14th December through Hilton.com or Hilton worldwide direct channels only, ending at 23.59 GMT (UK time) on 14th December. 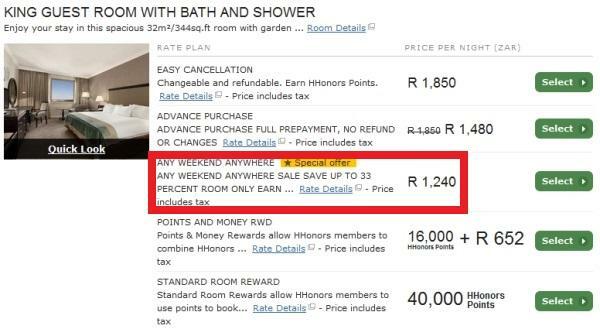 Must book plan code PGAWA8 or PGAWB3 for the HHonors exclusive booking period or AW8 for Hampton by Hilton properties). Bookings are available to the public between 16th December 2013, and 31st January 2014. Must book plan code PGAWA7 or PGAWB3 or AW7 for Hampton by Hilton properties). Participating hotels are offering a 33% discount (which varies by participating hotel) off the easy cancellation rate and the easy cancellation bed and breakfast rates. Participating Waldorf Astoria™ Hotels & Resorts, Conrad® Hotels & Resorts, DoubleTree by Hilton™, Hilton Hotels & Resorts, and Hilton Garden Inn™ properties are offering a discount on the easy cancellation rate and easy cancellation Bed & Breakfast Rate. . Participating Hampton by Hilton™ properties are offering a 15% discount on the Best Available Rate. The following properties are offering a 10% discount off the easy cancellation rate and easy cancellation bed and breakfast rates – Hilton Eilat Queen of Sheba, Hilton Tel Aviv and Waldorf Astoria Jerusalem. Discount only valid for weekend stays, other than at some participating hotels where some additional availability may be added during the period 19thth December 2013 to 5th January 2014, for participating hotels), unless otherwise specified by hotel. Some hotels may extend this offer to stays that include a Monday, Tuesday, Wednesday and/or Thursday night regardless of the arrival day. Midweek only availability at. DoubleTree by Hilton Dunblane Hydro, Hilton Glasgow Grosvenor and Hilton Bath City. .At the following properties, available rooms apply to the Deluxe or Deluxe Plus category:, , Hilton Liverpool, Hilton Newcastle Gateshead, Hilton Belfast, Hilton Dublin, Hilton London Green Park, Hilton London Islington, Hilton London Tower Bridge, DoubleTree by Hilton London – Tower of London, The Waldorf Hilton, DoubleTree by Hilton London – Westminster, Hilton Glasgow Grosvenor, Hilton Brighton Metropole, Hilton Garden Inn Luton North, DoubleTree by Hilton Amsterdam Centraal Station, Trianon Palace Versailles, A Waldorf Astoria Hotel, Hilton Rotterdam, Hilton Strasbourg and Hilton Sharm Sharks Bay Resort.